Final Call Newspaper (FCN): What is your reaction to the 12-minute CBS, 60 Minutes program taken from a nearly 4-hour interview? The Hon. Minister Louis Farrakhan (MLF): It appears that the aim of 60 Minutes, CBS and Mike Wallace was to make the American public believe that I, Louis Farrakhan, ordered the assassination of Malcolm X. It in no way reflected the spirit of Miss Shabazz and myself and our attempt to continue the path of reconciliation started by Dr. Betty Shabazz and me in 1994 and 1995. FCN: Specifically, how did the interview come about and did you have any hesitancy about doing it, considering Mike Wallace’s history with the Nation of Islam? MLF: Yes, I had reservations about doing it. It came about after Miss Shabazz and I had started a dialogue when brother Abdul Aziz, who was one of those accused, tried and found guilty of the assassination of Malcolm X, was made the Captain of the Fruit of Islam (F.O.I.) at Mosque #7 in New York. There was an outcry from some members of the Nationalist community and from Miss Shabazz over my apparent insensitivity in putting this Brother in the position of Captain over the Mosque in New York eight months after the passing of Dr. Betty Shabazz, in spite of the fact that it is well known that Brother Aziz was an innocent victim of the conspiracy of the United States Government and others to name members of the Harlem Mosque as participants in the murder of Malcolm X. Because of Miss Shabazz’s pain, she wanted to meet with me. We met at the school of Haki Madhubuti here in Chicago. In the meeting were former Supreme Captain Abdul Sharrieff Muhammad, Haki Madhubuti, Miss Shabazz, and myself. She expressed her pain at my decision, and she expressed anguish at our calling for the government’s opening of the files on Malcolm X so that the whole truth might be made known. Her concern was that we would call for such an opening of the files without ever consulting the Shabazz family. I listened carefully to her and expressed to her our sincere regret at having caused her and her family further pain, but, since we have had no real dialogue in 30 years or more, we made a decision that we thought was in the best interest of our national development. Subsequent to that, I wrote her a letter that I promised I would write after thinking deeply over the things that she had said. Because Miss Shabazz has had a long-standing and friendly relationship with Mike Wallace, whom she affectionately calls "Uncle Mike," she shared contents of my letter with him, and, the suggestion was made that she and I should have a video taped dialogue. It was suggested that it be done during Black History month of 1999 in hopes of furthering the process of healing. I agreed. Unfortunately, I became ill and suffered my near death experience. When my strength began to return, the idea of such a televised meeting was revisited and I agreed to this dialogue, but, I wanted Mr. Wallace to put in writing what he had in mind. After receiving his letter, knowing that he was the man that launched the Nation of Islam into the national public spotlight in 1959 with his televised show of "The Hate that Hate Produced," I agreed. By the way, Brother Malcolm and the Honorable Elijah Muhammad were greatly offended by the hatchet job that Mike Wallace did with the taping of their words, and, from that time, the relationship between Malcolm X and Mike Wallace was adversarial until 1964. After Malcolm X left the Nation, he went to Mike Wallace with the information of the Honorable Elijah Muhammad’s personal life that he knew Mike Wallace would use to discredit the Honorable Elijah Muhammad. Thus, they initiated the atmosphere and the process into which I and other ministers of the Honorable Elijah Muhammad spoke in defense of him and this is what created the atmosphere that ultimately led to Malcolm X’s assassination. From that time period of the scandal, their friendship began. 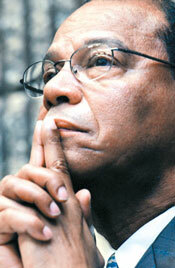 Mike Wallace was close to the scene of Malcolm X’s break from the Nation. He had several conversations and meetings with Brother Malcolm before the assassination, and, his friendship with the family continued. So, my thinking was, who was best to ask questions of me relative to Brother Malcolm as well as to Miss Shabazz that we might for posterity put the whole story, or at least as much as we could, on video tape to aid in the healing process. I told Mr. Wallace to ask me any questions that were on his mind relative to this, and this he did. I knew I had nothing to hide. FCN: There were many glaring omissions in the 60 Minutes program. For example, was there any discussion of your 1994 defense of Qubilah Shabazz, who the government accused of hiring a hit man to assassinate you? If so, what was the discussion? MLF: Some of these things were touched upon in the four-hour dialogue, but, we must remember that the discussion of the process of healing and atonement toward reconciliation was not the aim of 60 Minutes. Therefore, my discussion with Dr. Shabazz, her standing with me at the Apollo Theatre, where Mike Wallace and his wife were present; her presence and speech at the Million Man March with two of her daughters present, and, the continuing effort on the part of Dr. Betty Shabazz with members of my family and staff to foster the reconciliation were all omitted. This bears witness to the evil intention of Mr. Wallace and 60 Minutes. They did not want the American public to see us in the process of healing. They wanted the American public to see me as a murderer, and, in so doing, they wanted to contribute to my murder by, first, assassinating my character and also creating an atmosphere of controversy around Miss Shabazz and myself that might lead to a repeat of the tragic events of 1965. For Mr. Wallace, in his commentary, to say that Dr. Betty Shabazz believed that I was responsible for the murder of her husband and that Miss Shabazz and all of the Shabazz children believed the same was a very wicked and malicious thing for him to say, especially when in the four-hour interview Miss Shabazz said that she knew 35 years ago, that as the local Minister of Boston, I was nowhere to be found in the hierarchy of the Nation of Islam, nor did I have any national power to call for the death of her father. FCN: The media constantly refers to your "change" in light of your "coming to grips with your mortality." Are you concerned about your mortality, in light of your near-death experience, and your legacy? MLF: I would not give two seconds of my time to think about my legacy or my mortality. I am deeply concerned about healing the wounds that exist in the Black community over the assassination of Malcolm X. I am concerned about healing the wounds of the Shabazz, Muhammad and Farrakhan families, and healing the wounds of thousands of other families that have been so affected by the tragedy of the assassination of Malcolm X. My legacy will be whatever it will be when a period is put to my testament. I do not waste my time thinking about how history will view me, that is in the hands of Allah (God). FCN: Do you view the 60 Minutes broadcast as part of the overall efforts to redefine you to the public? MLF: No. Their effort is to continue the defining of me as an anti-Semite, a bigot, a hater, and now, a murderer. FCN: Opening the government files on the case, which you have called for, probably would answer a lot of questions. What can Blacks do to force the government to do so, and why is the government so reluctant to do so? MLF: We must remember that the brother who was caught at the scene of the assassination of Malcolm X exonerated the two members of the Harlem Mosque during the trial. When he was asked to name those who were with him in the murder of Malcolm X, he declined to do so. Thus, two brothers who were innocent were sent to prison. Later, Talmadge Hayer revealed to Attorney William Kunstler the names of four or five men from the Newark Mosque who were involved in the assassination. Mr. Kunstler tried to get the government to re-open the case and the government refused. Why did the government refuse? Were all of those five men Muslim zealots or were any of them agents of the United States government? I desired the files to be opened so that the full truth would be made known. Surely, if I were guilty, I would not want the government to open the files knowing that they tapped all of our phones. I will not call for the opening of the files unless Miss Shabazz, the Shabazz family, and I agree that this is the best way to settle all of the questions surrounding the assassination of Malcolm X. We, the entire Black nation, have a vested interest in knowing the truth because the truth is ultimately the only balm that can heal the wounds that all of us are suffering from. FCN: Do you think that a 12-minute segment on 60 Minutes could have expressed what took place in a 4-hour meeting? MLF: If 60 Minutes, Mike Wallace and CBS were sincere in showing our effort toward reconciliation, there was enough in that four-hour interview that could have given the viewer at least a seminal treatment of that process with the file footage to back it up. But, the fact that they used file footage from 1965 to show Brother Malcolm in a wounded and dying state, a grieving wife and mother, Betty Shabazz, and, to show file footage from an angry Farrakhan in 1993 reacting to an onslaught of propaganda that followed the release of the "Malcolm X" movie, and a spate of interviews that suggested the Nation’s involvement and my own, all of this makes clear the aim of 60 Minutes, Mike Wallace and CBS. FCN: Mr. Wallace mentioned in the interview that you were at the Newark Mosque on the day that Malcolm X was assassinated. Would you explain? MLF: It is interesting that when I started to explain my presence in Newark, Mike Wallace spoke over my voice, but, this is what I was saying. Minister James Shabazz, who was the Minister of the Mosque in Newark, was assigned to Mosque #7 as the interim Minister until a Minister could be chosen after Malcolm X left the Nation of Islam. Minister James’ tenure as interim Minister was from the time of April or May of 1964 to May of 1965. During that time, Ministers along the East Coast were rotated into the Newark Mosque on Sundays so that the spirit and the attendance of the Newark Mosque would not drop in the absence of its Minister. On Sunday, February 21, 1965, the day of the assassination of Malcolm X, I was assigned to teach at the Newark Mosque. FCN: What was your objective in agreeing to a televised discussion of this subject with Miss Shabazz at this time? MLF: I knew that the most we would have gotten from 60 Minutes was one or two segments and that one or two segments could never say what she and I wanted to contribute to the process of healing, but, I thought that if we could put on the record the truth as we understood it, and, if Mike Wallace had the chance to ask me all of the hard questions that he could, then, those who are scientists could use a voice stress analyzer or other methods and it would bear witness that everything that I said was the truth, and, that this might be a balm in the process of healing not only in our personal families, but, it might heal a nation of Black people in America and throughout the world that have been wounded by the untimely death and tragic assassination of Malcolm X.
FCN: How is your family handling Mike Wallace’s implication of you in the murder of Malcolm X? MLF: My family is very angry. I have young teenage grandchildren who, after seeing this portrayal of their grandfather, were raising questions, weeping and looking at how their grandfather was being portrayed to the American public. They have to go to school and hear from their classmates ugly things about their grandfather. Many who love me are facing the affects of this, but, I say to all, "No weapon formed against the righteous shall prosper." I, and we, are assured of victory over all of the enemies of Allah (God), truth and the rise of the Black man and woman of America and the world.